The Loyola Farm has launched our weekly Market Stand! Every Thursday, from 11am – 1pm, we will be selling some of our harvest at the garden. All of the food produce grown at this garden is done so by both volunteers and city farm students. All proceeds from the market stand will be put right back into the garden upkeep fund. Leftover produce from the garden will be picked up and donated to the NDG Food Depot. Keep an eye on the “Loyola Market Stand” tab on the Loyola City Farm blog, as each week we will update which items we will have to sell. 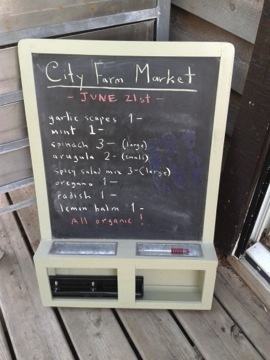 Directions to the Market Stand can be found under the directions tab on the main page of the Loyola City Farm blog.